While I’m finding myself cautiously pessimistic towards Barack Obama’s chances of being the success the world seems to be demanding of him I do acknowledge being drawn in to his story to a certain degree. Hot on the heels of a day celebrating one of history’s greatest fighters of racial equality we’ll witness arguably the most powerful position in the world – for the first time – being secured by an African-American. Those who know me well know I position myself in a rather awkward place on the racial equality scale: One who staunchly disagrees with racial prejudice, but who almost as staunchly supports an understanding and acceptance of the inherent differences between all of us. I find the common racial view is far too close to whitewashing, whereas the truth is that be it race or gender, there are differences between us. Celebrate that which makes us different. I only hope this is a day we’ll look back on in 15 years as the day real racism took another nail to its coffin. My favourite dishrag, The Toronto Star, posted a small aside in their Metro daily today discussing the “Dumbest president?” A rather amusing story of William H Harrison who, wearing no winter clothes to his 1841 inauguration in 9°C weather, caught a pneumonia and died only a month into his Presidency. Which makes the fact it’s not true so upsetting. It’s not like the Star to just make crap up. Want to carry the Olympic Torch? Coca-Cola and RBC want to offer you that chance; check out www.carrythetorch.com and promise me you’ll wear an overanything.com t-shirt. Stabbed Edmonton man opts to finish beer rather than seek medical assistance. 15 great examples of long exposure photography. Why House shouldn’t drink too much in Victoria. 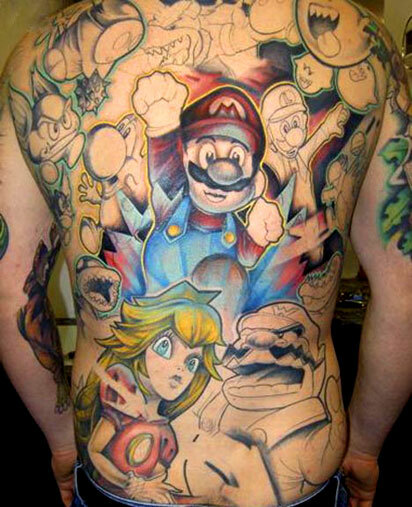 Yup, not going to regret this tattoo at all. Tips for future dumb criminals. Help me! Help me now! I need anyone in the GCA (General Canadian Area) to assist me in filling the hole in my 2L Harry Potter Coca-Cola bottle collection. In my infinite wisdom I purchased three of the four bottles and now they appear to be missing. The one I’m missing is Slytherin. If you haven’t seen these bottles, they’re 2L bottles of Coke with a small white area that displays one of the four Hogwarts schools when placed in the fridge. However, if you hold it perpendicular to light you should be able to make out the school on the bottle. If anyone happens to see one with Slytherin on it I’d be more than willing to pay cost + shipping + effort, or come pick it up if you’re local, and it would make me more than happy. You can even drink the Coke and just give me the bottle. Yes, I have joined the blogging century club. Although I’ve been “blogging” for about six years now, I’ve only been using one of these blogging utilities for a few months now. I started on Blogger and moved on to Movable Type a short while ago. So although, historically, I’m probably on my 1,000th blog, today marks post 100 of the new era. They don’t seem to be announcing it but Coca-Cola has released a new version of Cherry Coke with a brand new look. This old press release doesn’t indicate they’d be changing the flavour, but they definitely have. The new taste is much more similar to real fountain cherry Coke and it’s a vast improvement on that nasty stuff they were blasphemizing the company brand with before. So now it’s off to get a bit more work done, make dinner, and sit around the rest of the night. Should be cool, I’m looking forward to it. My fondness for Coke is documented. Repeatedly. What may not be so well documented is the fact that I think Pepsi tastes like snot. It’s an odd case – Coke is better than Pepsi. But Wild Cherry Pepsi is better than Cherry Coke. So this year, Coke releases the drink I’ve been making myself since childhood, Vanilla Coke, but now it comes premixed and in a pretty can for me. Much better. Kudos to Coke! And not only that, but a source has leaked to me that the new Vanilla Coke has been SO popular that they have fast-tracked the production of a Diet version, something even perpetually popular Cherry Coke never got. That tells you how well this is doing. Place your bets in the comments, y’all.